When it comes to holiday makeup, you're totally allowed to dare with sparkle, glitter, and bold colors! I took inspiration from the holiday lights you decorate your house with to create this festive golden holiday party look with shiny red lips, bright peach blush and metallic gold eyes! 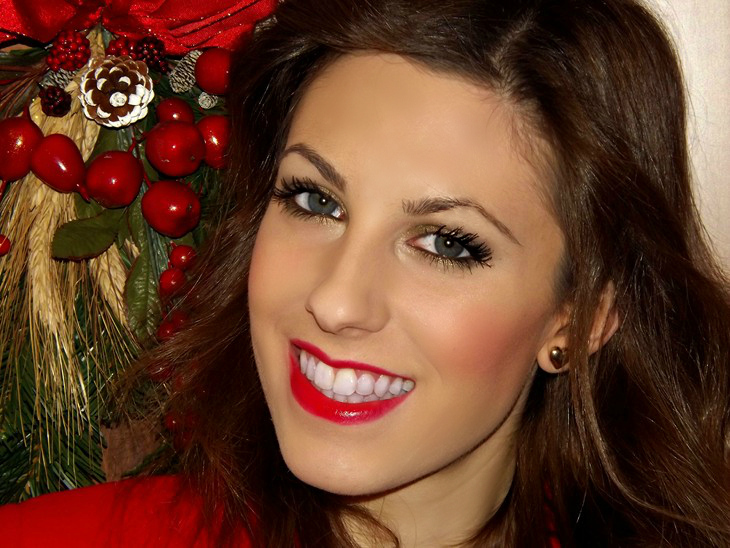 It's a very flattering makeup look that I'm wearing a lot during these Christmas days! If you try this out, tweet me or facebook me a picture! To all of you I WISH YOU A MERRY CHRISTMAS! Quando si tratta di makeup per le feste, è permesso osare con brillantini, glitter e colori vivaci ed intensi! Ho preso ispirazione dalle luci natalizie con cui facciamo brillare le nostre case per creare questo makeup dorato e festivo, perfetto da sfruttare in questo periodo a party o cene di Natale! Labbra rosse lucide, un tocco di blush color pesca luminoso e occhi color dorato antico! E' un makeup che dona praticamente a tutte, qualsiasi sia il vostro colore di occhi e carnagione, e che sto indossando moltissimo in queste giornate di festa! A tutti voi auguro un BUON NATALE! 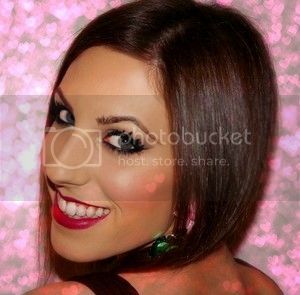 bellissime foto,adoro questo make up! make up meraviglioso!! ti dona molto! Bellissimo trucco e buon Natale!!! Your makeup looks so glamourous hun...Wishing you and your loved ones a very Merry Christmas, may it be a joyous and blessed one! Meraviglioso Make up ti sta divinamente! bel make up, anche io opterò per qualcosa di molto simile! sei stupenda cara :D *__* da me c'è un nuovo post "brillantinoso"
Excellent! Beautiful photo! Chic makeover! Che bella che sei tesoro! Questo make up è perfetto! :) Buon Natale - Merry Xmas - Feliz Navidad! :) Mina. Visit my blog The Style Fever: NEW POST ON MY BLOG! Hai degli occhi meravigliosi :) buon natale! bacio! Aww awesome blog! You have very beautiful eyes!!! Would you like to follow each other? Kisses! Che bella pelle :) belle foto! You look so beautiful, I love the gold metallic eyeshadow it looks dashing on you! Your eyes are pretty beautiful! you are so pretty! I love your make up... you look so fresh! Very pretty, love the red lipstick!! Nossa...você ficou linda, make perfeito! Could you pls follow me on my new blog? I will follow you back of course! waow you look like a Disney princess love it ! perfect ! thank you so much :) You're beautiful and I love your blog :) Following you!